Brazilian authorities have said they have cancelled the mining licence and halted operations at an iron ore mine where the collapse of a waste reservoir triggered a deadly mudslide. At least four people were killed and around 20 are missing after a deluge of mud and mining sludge burst through retaining walls at the Samarco mine Thursday and buried most of the nearby village of Bento Rodrigues. Residents and Brazilians have also criticized what they say has been lax communication by mine operator Samarco, a joint venture between the world’s largest mining company BHP Billiton Ltd, and the biggest iron ore miner, Vale SA. “The company will need to make a number of changes before we allow them to begin mining again,” said Minas Gerais state deputy environment secretary Geraldo Abreu. Brazilian President Dilma Rousseff has said authorities will direct their efforts at finding more than twenty missing people and will probe into the cause of the accident. “I pay my sympathies to the victims and their families. It is necessary to ascertain the causes and responsibility of the accident,” said Rousseff. State officials gave the order to close the mine Friday due to the seriousness of the incident and the need to investigate the risks for the population and the environment, a Environment Ministry spokeswoman told AFP. 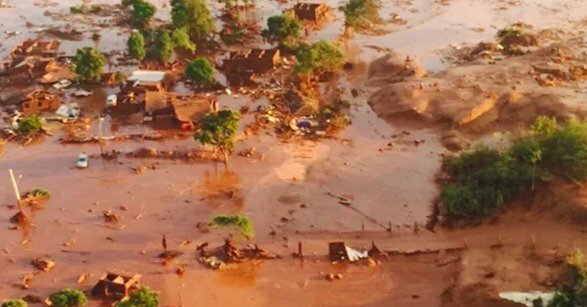 “Samarco is only authorized to carry out emergency actions aimed at minimizing the impact of the collapse and preventing new damages,” the environment office said in a statement. The two mining giants have seen their stock prices plunge since the disaster. Shares in the Anglo-Australian miner BHP Billiton fell five per cent yesterday in London to a new seven-year low. BHP Billiton says in light of the disaster, the company is now reviewing its 2016 production guidance. Shares in Vale racked up heavy losses Friday and were down one per cent yesterday in Sao Paulo. Deustche Bank analysts warned the disaster could shut down Samarco for more than a decade. Market analysts have told local media the clean-up costs of the reported “largest ever spill of its kind” could top $1 billion, of which BHP is liable for half. Samarco, the 10th-largest exporter in Brazil, is 50-per cent owned by both companies. It has announced plans to hire external investigators to determine what caused the disaster. The mine did not have sirens to warn residents in case of such a collapse.